What is the Building Envelope and why does it matter? How can it fail? What role does tape play in air sealing? In this post, we demystify the building envelope, helping builders and contractors identify weak spots in building tightness in order to improve air sealing, and create more structures that are sustainable, cost-effective and comfortable in all conditions. By nature, we do not expect our environment to maintain a consistent, 74-degree-Fahrenheit, 50% humidity, climate. Our perception of comfort is quite adaptive and is based on circumstance, the expectation of environmental conditionals and activities. We use umbrellas when it’s raining. We dress in layers when it’s cold. We use sunscreen when exposed to summer’s intense UV rays. And yet, we expect our homes to provide thermal comfort and protection from the natural elements, at a consistent 74-degrees, every day. Walls, roofs, windows, and doors all play a role, but really it’s the building envelope that makes this possible. At its simplest definition, the building envelope is the exterior or shell of a building that repels the elements. At its most complex definition, it’s an engineering system that meshes elements such as structural integrity, moisture control, temperature control, and air pressure boundaries into a single design strategy. It is the physical separator between the conditioned and unconditioned environment of a building including the resistance to air, water, heat, light, and noise transfer. It’s the part of the house that you can draw a line around: the roof, the walls, and the foundation. While the building envelope is a silhouette of sorts, it’s important to remember that these are compounded layers. Each part of the building envelope must be thought of as a collection of smaller pieces working together to provide structural support. The way the foundation and walls are built is essential in creating a sturdy structure, or a base, for the rest of the building. This is one of the main functions of construction because a well-constructed envelope is necessary to simply keep the structure standing. The building’s design must be measured and carried out meticulously to ensure that there are no open edges, cracks between the windows and walls and imperfections between the roof and the walls, or between the walls and the foundation. It is all included within the building envelope concept. That said, each part of the enclosure faces different challenges. On a construction level, the home’s building envelope is a series of composite layers —whether it be wood, glass, veneer, drywall, etc. — each with their own permeable properties that must be considered. A proper building enclosure works together to achieve the same goals of stopping or slowing the flow of air, water, and heat while still allowing the inevitable intrusion of water as a way to dry out. All told, building envelope components work together to perform four basic, but critical functions: structural support, moisture management, temperature regulation, and air flow. The latter three—moisure, air and thermal—characterize the “control” functions of the building envelope, those facets that ensure a house is energy efficient, comfortable, and sustainable. 1. Moisture control. The most important element of the envelope’s control is its ability to regulate the transfer of moisture. Moisture presents a distinct danger to the overall integrity of a building and must be taken into account. Moisture can and will impact your building over your head (roof), under your feet (basement/floor), and on your sides (walls). Each component must be addressed to prevent unwanted transfer from causing expensive damage. It’s essential in all climates, but cold climates and hot-humid climates are especially demanding. 2. Air control. Controlling air flow is key to controlling energy consumption, ensuring indoor air quality, avoiding condensation, and providing comfort. Control of air movement includes flow through the enclosure or through components of the building envelope itself, as well as into and out of the interior space. So, for example, when we talk of a house’s draftiness, we’re talking about the control of air flow. 3. Thermal control. Thermal transfer brings to mind how comfortable we feel inside our own homes. Is it too hot? Is it too cold? If you want to address this question, it is easiest to look up. As we learned in elementary school, heat rises, and if you don’t have enough resistance in the building to prevent heat from rising right through the roof, it is time to raise your building envelope IQ to prevent heat (and money) from escaping. A loose building envelope allows more of a natural air transfer to occur, which improves indoor air quality which can remove the need for mechanical ventilation. These types of building envelopes make the building more drafty and uncomfortable, it also makes the building harder to regulate temperature levels. This creates a higher chance of mold or mildew, and higher quantities of heated or cooled air are able to escape through leaks in the loose building envelope. This will increase energy bills along with negatively impacting the environment by releasing more greenhouse gases. A tight building envelope allows for a high level of control over indoor air quality, temperature, humidity levels, and energy consumption. This requires more insulation, caulk, adhesive tape, sealants, and energy-efficient windows to acquire a tight shell for the building. This leads to fewer drafts and a more comfortable building for its occupants, which often results in less waste in heating and cooling costs. Tight envelopes also have a lower chance of producing mold or mildew from moisture infiltration, this can help prolong the life of the building components. The downside to a tighter building envelope is it requires more extensive mechanical ventilation systems because it limits how much natural ventilation can occur. 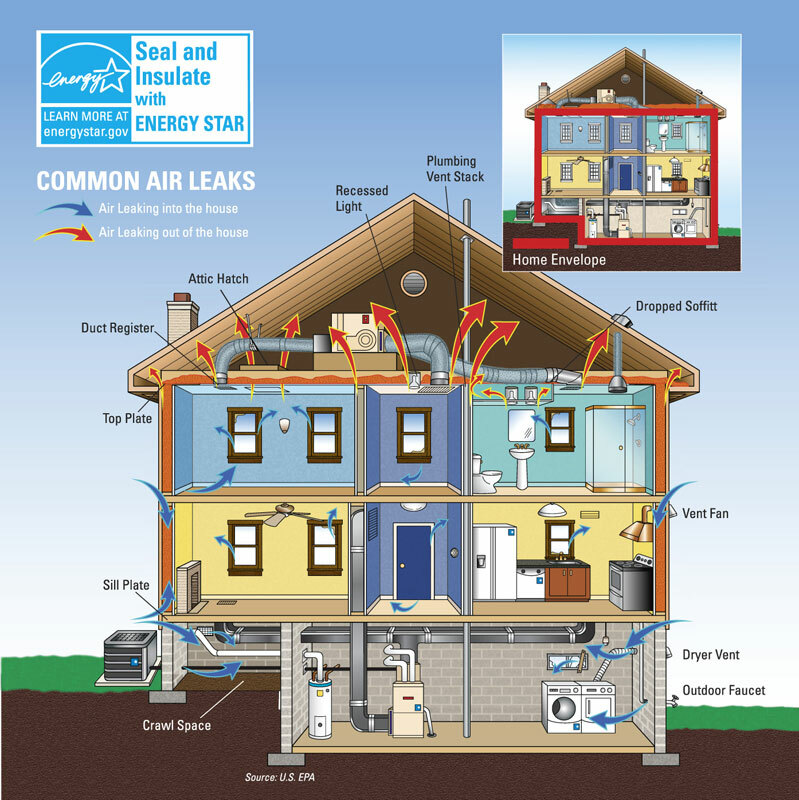 Additionally, good building envelopes which prevent drafts and other air leaks allow for tighter control of the air pressure inside as well as the temperature. Without that, cooling and heating sources are constantly fighting the exterior elements that are making their way inside the building. Not only is this expensive, it makes being inside the building uncomfortable. For example, a home where the air conditioning system has been shut off all weekend would take longer to cool on Monday morning if the building design allows for leaks and drafts. The tight envelope provides the ability to adequately control the quality of the air, making the interior of the building more comfortable and pleasant. What are best practices for building envelope systems? We’ve said it before and we’ll say it again: Build it tight; vent it right. Without a virtually airtight, well-insulated building envelope, achieving the energy performance levels required for current IECC Building Codes and California Title 24 is nearly impossible without a massive investment in renewable energy systems. The good news for builders is that getting the building envelope right is one of the lower-cost, higher-return investments when designing for net-zero performance. It all boils down to good building practices. When the building envelope system is designed and constructed properly, very few occupants pay attention. But when the building envelope fails (and even the best-built projects do in time), everyone notices. Those failures can include aesthetic loss, corrosion, poor indoor air quality, energy inefficiencies, and, in some cases, life-threatening structural failure and eventual litigation—a builder’s worst nightmare. 1. Design deficiencies. Architects occasionally specify materials or design systems that are inappropriate for their intended use. Common mistakes include specifying materials that are incompatible with materials with which they come into contact or have inadequate performance criteria for thermal movement, structural capacity, or water penetration resistance. Issues also arise when subcontractors try to reduce the weight, size, or amount of building envelope components (aluminum, glass, sealants, flashing, etc.) required on a project. This can lead to inadequate performance or capacity of the materials specified. 2. Material failure. It’s also common for properly specified materials to fail to meet the published performance levels. This could be a result of errors in the manufacturing, handling, or storing of the product or components within the product. Common examples include degrading sealant adhesion, laminated glass delamination, and metal fatigue. While the anticipated performance levels are often based upon measured statistical performance, the strength of materials varies. 3. Poor workmanship. During construction booms, the problem of poor workmanship is exasperated as a result of having many inexperienced, unsupervised, and untrained personnel working on projects. It is common to find building envelope components not installed per the manufacturing specifications. Word to the wise: Putting the right people in the right job goes a long way toward proper installation and overall profitability. 4. Acts of nature. Even with flawless installations, bad things can happen to good work when environmental conditions exceed those that were anticipated during design. The effects of hurricane-force wind loads, driving rain, and extreme temperature fluctuations can overload a properly designed and constructed building envelope, causing damage to the system and making it vulnerable to further deterioration or failure. While failures of this type cannot be stopped, many can be prevented through routine inspection and maintenance to identify small problems before they become big ones. As customers demand more energy-efficient homes and building energy codes become stricter, more and more contractors are using adhesive tape to seal the building envelope. Today’s newer and higher-performing seaming tapes offer builders better choices and multiple advantages over conventional building materials. These tapes actually stick better over time, are more durable and are more weather resistant. Indeed, modern adhesive technology is much more sophisticated as a whole. Clean, easy application. Unlike liquid and foam sealants, adhesive tape is not messy and it’s easier to apply. Leaders in performance building, like Matt Rissinger, use it all of the time. Check out Tight House Construction and 4 Tips to Building an Efficient House, for example. Clearly, the home’s building envelope is a critical concept to grasp. At ECHOtape, we’ve embraced the fact that a better building envelope leads to a healthier, more sustainable building. We’re excited about the expanding role adhesive tape will play in building envelope design, or redesign, and our goal is to help builders and contractors find the weak spots in building tightness, improve air sealing, and create more structures that are sustainable, cost-effective and comfortable in all conditions. Because a well-maintained and regularly observed building envelope doesn’t just save on energy bills; it will be better built to stand the test of time and mother nature.